The 2019 Utah State Legislative Session is expected to be a very important session affecting Utah’s independent businesses. Bills concerning tax reform (including business personal property taxes), transportation, education, and affordable housing are all up for debate. 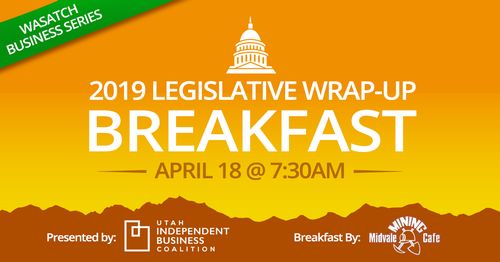 Join us for breakfast on April 18, 2019 when Dave Davis of the Utah Retail Merchants Association, John Lair of Momentum Recycling, and two state legislators having important tax and business committee authority will review key legislation that was debated and was passed in the 2019 session that our businesses need to understand now and prepare for in 2019. We will also discuss how business owners can more effectively advocate for themselves and better influence legislation in Utah. This is the second event in the 2019 Wasatch Business Series, a collaborative effort that is focused on bringing impactful networking and educational opportunities to business owners across the Wasatch Front. The Wasatch Business Series is brought to you by the Utah Independent Business Coalition, Holladay Chamber of Commerce, Sugar House Chamber of Commerce, Millcreek Business Council, South Salt Lake City Chamber of Commerce, and the Murray Chamber of Commerce.